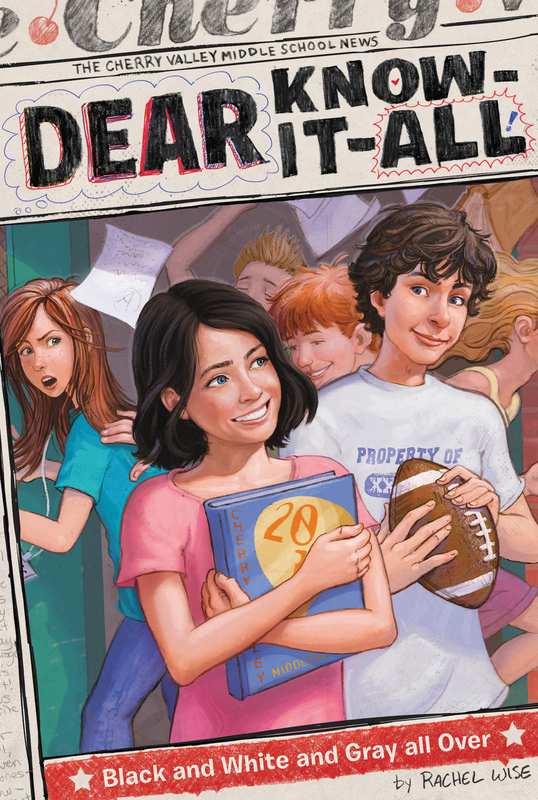 Sam needs some serious advice when a new staff member competes for newspaper bylines—and for her crush’s attention. Cherry Valley is abuzz when a new girl comes to town from the UK. Kate Bigley has dark hair, bright blue eyes, and an English accent—and she has dreams of being a reporter. Mr. Trigg is thrilled when Kate joins the Cherry Valley Voice staff, but Sam is less excited to have some competition. Especially when Kate is paired up with Michael Lawrence for the next big cover story. What if Sam’s crush gets a crush on someone else? FOREIGN STRANGER STEALS GIRL’S LIFE! I don’t want to brag, but I think my dream of becoming a reporter one day is well on its way to really happening. I write a lot of articles for the Cherry Valley Voice, my middle school newspaper (okay, not just I—I write with my supercrush, Michael Lawrence). But our last few articles especially have gotten a lot of praise. Kids stop me in the hall and say things like I really liked what you wrote about Pay to Play, or Way to go on your coverage of the cheating scandal! It’s totally cool and it feels great! I also get lots of anonymous compliments because I write the advice column called Dear Know-It-All for the paper. No one at school, and I mean no one—not even my best friend, Hailey Jones—knows that I am the Know-It-All this year, but I do overhear kids saying really nice things about the Know-It-All responses (my responses!) in the paper. All this, plus Mr. Trigg, the faculty advisor for the Voice, has taken to automatically giving me and Michael the plum assignments. He calls us the Dream Team, his “star reporters.” I love it! Of course, I’d love anything officially linking me with Michael, Mr. Cutie himself. Sadly, my nearest and dearest just don’t get it. Like yesterday I was tutoring Hailey for her grammar exam (she’s dyslexic and I always help her with her studying for tests), and I said something flat out, just a fact, and she got annoyed with me. All I said was, “You’re lucky your best friend happens to be the best writer in the school.” I’m not making it up. It’s a fact. But Hailey told me I need to get over myself. I mean, maybe Michael Lawrence is as good a writer as I am, but it’s not like he’s going to tutor Hailey, right? I was just making conversation, stating the obvious. I don’t know why she got so upset about it. Then at dinner I was telling my mom and my older sister, Allie, about a new writing camp I’d like to attend this summer and how I have to be nominated by a teacher at school in order to apply. I said it’s a total no-brainer because Mr. Trigg will do it for me. After all, besides Michael, there’s really no one on the newspaper staff who’s as good as I am. It’s just a fact. But Allie was all snide and said, “Oh, sorry! I forgot about all those Pulitzer Prizes you’ve won,” and my mom (my very own mom!) told me not to get a big head. Whatever, people. I am all about facts, and this is just a fact: I’m a great reporter. Today we have our staff meeting for the next issue, when Mr. Trigg will dole out the assignments for our new articles, and I can’t wait. I know I’ll get to work with Michael again (hello, quality time with my crushie! ), and I know I’ll get a juicy, hard-hitting article to report, and I know Mr. Trigg will sing my praises in public like he always does. I got to the newsroom a little early in order to get a good seat and save a spot for Michael, who always dashes in at the last minute. I snagged the little sofa just inside the door—the best spot—and I spread out my stuff to keep people away from Michael’s half of the sofa. Then I pulled out my latest fresh notebook and began making a list of things I needed to do after school today, including stop by the Dear Know-It-All mailbox to collect any new letters and check my bank balance to see if I can afford to buy two new long skirts—kind of my new trademark look—since Allie pointed out that mine are all trashed at the bottom hems. I hate to shop and find it totally boring, plus it kills me to spend money on clothes, but Allie insists on it when the things I own get too dingy. The newsroom filled up, and sure enough, just as Mr. Trigg came out of his office and strode to the front of the room, Michael popped in the door. He looked at me on the sofa and gestured to the empty spot (as if it wasn’t him I was saving it for!). I nodded and quickly cleared my things, and he settled in right next to me, totally cozy. I had to take a moment to think, This is one of the happiest days of my life. I smiled and sighed and turned my attention to Mr. Trigg, who is British and charming and very witty. “Good morning, gang! Glad to see you all! Righty-ho, we have lots to discuss today . . . .” He rifled through a pile of papers in his hand and found the one he was looking for. “Aha! Yes! Hmm. Here!” He looked up and scanned the room. Despite Mr. Trigg’s kind of careless appearance—his tall, lanky frame stooped as usual, his suit wrinkled and bagging, and his trademark scarf hanging limply around his neck—he is an exacting journalist and an enthusiastic one. He was as excited today as he always is when starting a new issue, and his excitement was contagious. There were groans all around the room, but Mr. Trigg shushed everyone with a smile. “It’s getting quite popular round the world these days. Hmm. Let’s see what this article says. Students receive the same number of vacation days as always. Breaks are more frequent but shorter . . . . Shorter breaks increase knowledge retention . . . . You know, students do tend to forget quite a lot over the summer,” he said conversationally. “In addition . . . blah, blah, blah . . . The school buildings don’t stand empty . . . . Easier for working parents . . . and so forth. Quite interesting, I daresay. Now, who should it go to . . . ?” He looked up and surveyed the room, and his eyes stopped on me and Michael. I’d known we were going to get it from the moment he started telling us about it. It just felt like a me and Michael article—big, juicy, timely, lots of research . . . . But suddenly the door to the newsroom opened and everyone looked up. In the doorway was a very pretty girl my age. She had black, wavy hair, a pale, creamy complexion, and bright blue eyes, and she spoke with an English accent, to boot! She was smiling and didn’t seem at all nervous to be interrupting. “Manchester, England, right?” Mr. Trigg interrupted, pointing his finger at her as a huge smile lit up his face. “Oh, we have that back home. It was all over the papers when they started. Quite the controversy at first, but everything seems settled now in the schools where they’ve got it. My friends are all a bit worried it’s coming for everyone!” Kate Bigley perched on the arm of the sofa where Michael and I were sitting, and she crossed her legs, settling in. All eyes were on her, but she didn’t seem to mind one bit. I don’t know why this immediately annoyed me, but it did. As did her sitting right next to Michael without even asking if it was okay. This Kate Bigley was pretty forward. Michael nodded up at her, and she smiled back, nodding too. Wonderful? How about Horrible?! I wanted to throw up. I felt a hot blush starting, a mix of both anger and mortification. How could Mr. Trigg just cut me out like that? He knew that was my article! How could this girl sandbag him in just minutes, stealing my crush and my assignment in one fell swoop? Still chuckling to himself, Mr. Trigg shuffled his papers again and headed back to his desk in his little side office off the newsroom. Everyone started chatting loudly among themselves about all the new upcoming articles. Even Kate “Fancy Accent” Bigley and Michael “Traitor” Lawrence were chatting away, totally oblivious to the fact that I, the star reporter of the Cherry Valley Voice, the likely editor in chief some day, had just been totally snubbed in a staff meeting. Irate, I stood and stalked across the room to Mr. Trigg’s office. “Mr. Trigg,” I said, knocking firmly on the door frame. “Ms. Martone!” he said in a friendly voice, rocking back in his desk chair. “Mr. Trigg, you didn’t give me a story for this issue,” I said, trying to control my emotions. “I didn’t?” He shuffled his notes, confused but not bothered by this news. Finding nothing, he turned back to me. “Well, you have been working awfully hard lately, so perhaps a little break is really a blessing in disguise, isn’t it?” he said with a chuckle. “Um, no,” I said. Normally I wouldn’t mind taking it easy on an issue here and there, but to have Kate Bigley steal my life and me be left swinging in the breeze? No way! “Um . . .” My head was spinning. “All righty then?” he prompted, turning back to work at his desk. “Okay, I guess . . . ,” I said. In a fog, I drifted out of Trigger’s office and through the newsroom, passing Michael Lawrence and Kate Bigley, who were having quite a good time chatting on the sofa, side by side, discussing what should have been my article! Michael didn’t even notice me leaving. This was like a bad dream. Out in the hall, I headed off to earthonomics class, still wondering what had just happened in there and knowing I didn’t like it. Not one bit. Yes, but not for long, I thought. Not for long. I needed to find Hailey Jones, my BFF and partner in all discussions boy-related. We needed to discuss the Kate Bigley situation ASAP!